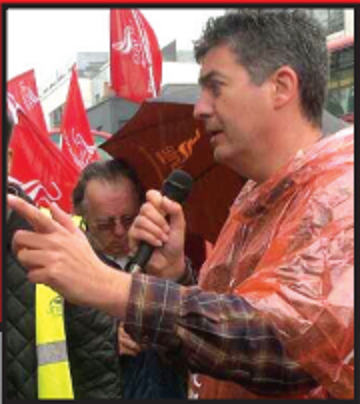 On 12th February 2014 Bryan Kennedy, Project Manager and Unite Workplace Convener at One Housing Group was suspended from his job pending an investigation. It is the view of this Branch that Bryan has been targeted as a direct result of his trade union activities. In 2013, One Housing Group (OHG) hit the headlines for all the wrong reasons. Unite members there fought a long battle with management over sickening reductions in the salaries of frontline workers (some up to 30%) despite record surpluses at the association and an 11% pay rise for the Chief Executive of around £30k. (Read about the dispute in Inside Housing). As lead convenor, Bryan Kennedy led the struggles to mitigate the suffering that the association was inflicting on its hardworking staff. In his Project Manager role, Bryan worked tirelessly for 10 years at OHG and has an unblemished record. Yet on the eve of an important Joint Negotiation Committee meeting with the association's management, OHG suspended Bryan. It was a deeply cynical manouevre intended to decapitate the union just as it was about to negotiate an enhanced pay deal coupled with increased payments for staff who currently do sleep-ins and are apparently paid below the National Minimum Wage. The Unite Housing Workers Branch will not tolerate attacks on reps whilst carrying out their duties. Like the members at OHG, we are committed to vigorously defending Bryan Kennedy. Members have taken part in a consultative ballot voting 84% in favour of strike action to defend lead Bryan Kennedy. 1. Join our protest and forward information to your members or supporters locally. 2. Send Messages of support to Bryan and Unite members at OHG in this campaign. 3. Lend us your social networking profile for the day with an 'I'm Bryan' photo and add the weblink . Follow us on Twitter @unitehousing, re-tweet and hashtag 'I'mBryan' 'OneHousingGroup'. 4. If you can't get to the protest please wear unite/union campaign material on the day and discuss with others locally. 5. Get involved and active in your union campaigns in the workplace and wider community. This is attack on collective organising, together we are stronger! By post Unite LE1111, PO Box 66701, London E11 9FB.